Chile Crece Contigo was established by the Chilean government to support and protect children and families. As one small part of this extensive information and education portal, they offer Spanish online games for preschoolers. These well-designed games are an excellent introduction to preschool vocabulary and concepts for Spanish language learners. There are 5 online games, most with several levels. The games with audio are particularly well-suited to children learning Spanish. The link to the activities is at the end of this post. Level 1 of this Spanish online game has the most audio and teaches body part and animal vocabulary. Children just move the mouse over the picture of different animals and they fill with color. Then, the color disappears and reappears as body parts are highlighted and pronounced. Many of the words are used in more than one of the drawings. Children will hear this general body part vocabulary: nariz, boca, cuerpo, orejas, ojos, manos, cabeza, pelo. The game also uses this vocabulary for animal body parts: patas, cola, cresta, pico, ubre. The animal vocabulary in the game is gallina, mono, jirafa, rana, vaca. Level 2, juguetes and Level 3, la familia, let children choose the colors to use. When they finish the picture, they hear a sentence that mentions the object in the picture: Muy bien, pintaste la muñeca. ¿Cuál es la figura que falta? These games involve completing a very simple sequence by dragging and dropping an object. 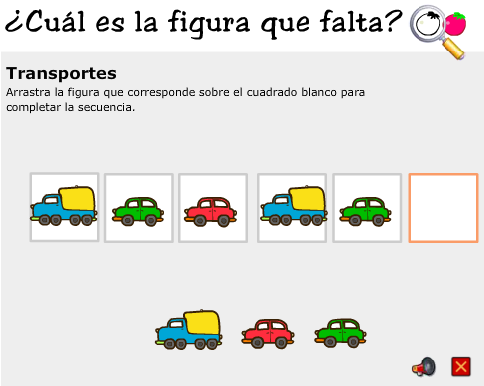 All three levels of this Spanish online game have excellent audio because they pronounce the entire sequence to help children understand the pattern. Level 1 uses food vocabulary for the sequences. The words that children see in pictures and hear are: tomate, naranja, melón, sandía, cereales, leche, queso, yogurt, zanahoria, lechuga. Level 2 uses vehicles and colors for the sequences. Children hear: auto verde, camión, auto rojo, avión, auto celeste, barco. Level 3 uses shapes for the sequences. The vocabulary is: círculo, triángulo, cuadrado, rombo. Each level of this game begins with an introduction. The introduction presents the vocabulary and relates it to a sound. So, for Level 1, Animales, kids see a picture and hear Este es un mono y hace (monkey sound) or Este es un caballo y hace (horse sound). There are 9 animals. The other levels of this Spanish online game have similar introductions for the 5 vowel sounds and 9 musical instruments. After the introduction at each level, the game consists of listening to a sound and clicking on the correct picture. This game does not have as much audio has the others. At each level, children put together a very simple puzzle. Level 1 has puzzles of insectos and Level 2 is animales. The Spanish words are pronounced when players put the pieces together, so that kids hear sentences like Armaste un caracol, Armaste una abeja, or Armaste una cabra. The final game has only one level. Players hear, for example, ¿Cuántos globos hay? They click on each balloons and the audio counts. The highest number is 14. They hear the question for a variety of vocabulary including globos, cajones, libros, naranjas, perros, volantines. The Chilean government has restructured their site since I wrote this post, and Chile Crece Contigo has lots of resources for parents and parents. You can the games and other resources here: Chile Crece Contigo. There are five circles with images. The name of the game shows when you mouse over them.